DUMBARTON shocked SPFL Championship leaders Hamilton Accies and gained their first home league win since August. DUMBARTON shocked SPFL Championship leaders Hamilton Accies and gained their first home league win at the Bet Butler Stadium since August. On a wet and windy day, a crowd of 642 saw a competitive match in which dominance swung from one team to another before Ian Murray's men secured a valuable victory which moved them up to seventh place in the table. The home side took the lead in the 11th minute when Bryan Prunty dummied a cross and Garry Fleming shot home from the edge of the box. However Accies continued to look dangerous, and they equalised when Mickael Antoine-Curier got behind the defence and set up a simple finish for James Keatings. Both sides also had efforts which rebounded off the woodwork. After the break it continued to be end to end, but with ten minutes to go Garry Fleming crossed and skipper Andy Graham, later named man of the match, shot home in a goalmouth melee. In the final minutes Sons defended resolutely, and came closest to scoring when a shot from sub Steve McDougall rolled just wide of the far post. 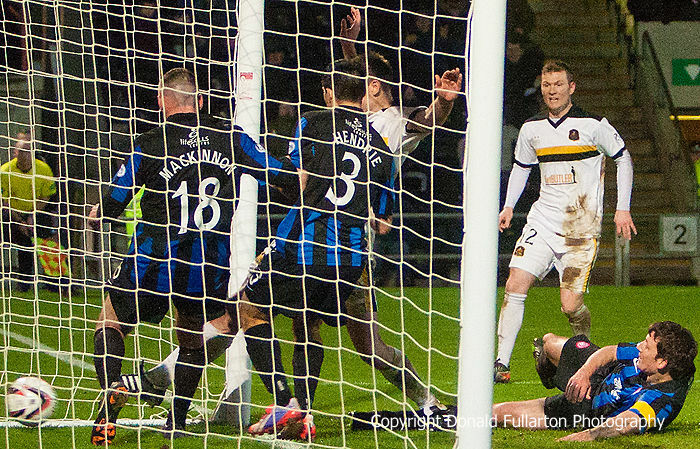 The picture shows Andy Graham netting the winner.